Prestige Emergency Lights supplies high quality LED lighting for police, fire, EMS and public safety vehicles. They continually update their catalog with the newest innovations in emergency and non-emergency LED lighting. This article provides a short Prestige LED light bar review for each of their LED light bars. 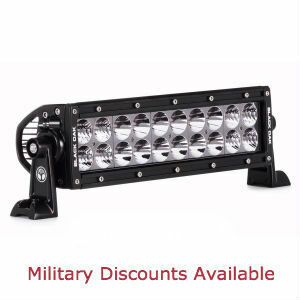 This light bar, measuring only 13″ by 5″ and with a profile of 1.5″, features two light heads front and back and one light head on each end. It provides 360 degrees of warning and consumes just 22 watts. There are 29 flash patterns built-in plus a steady-on mode. It needs only a cigarette lighter or other 12VDC car outlet for power. The plug has on/off and pattern switches. 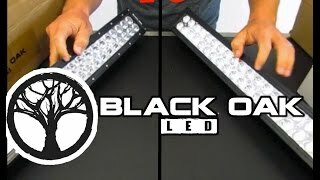 This light bar has two additional light heads front and back for a total of 38 1W LEDs. It is just 5″ longer than the Mini LightBar. It also has 29 flash patterns plus steady-on and a super low 1.5″ profile. Mounting is by strong magnets or by optional permanent mounts. It uses the same cigarette lighter power adapter and switching as the Mini. 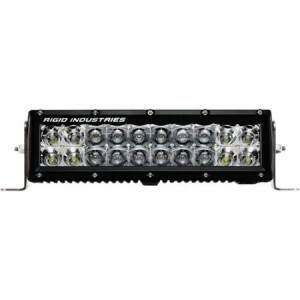 This Warrior light bar adds two more light heads front and back for a total of 54 1W super bright LEDs. It weighs in at under 9 pounds and can be attached via magnet or permanent mounts. It draws just 3.5 amps via a cigarette lighter adapter with power and flash switches. 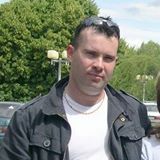 It draws a maximum of 4.7 amps and connects with a basic automotive wire harness. Roof mounting is accomplished with universal gutter mounts. This full-size LUMAX Warrior light bar has the same features and options as the 40″ light bar except that it contains 86 1W LEDs and a total of 22 customizable light heads. It draws a maximum of 7.5 amps of current at 12VDC. 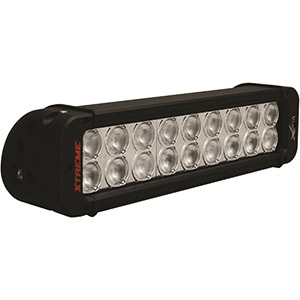 Prestige also carries another mini LED light bar version that uses 1W LEDs and draws 3.5 amps. It has a single, fully-sealed, rectangular polycarbonate surround that measures about 20 by 10 inches. This cover can be ordered in one of several colors. Four magnetic feet are used for roof mounting. It features 18 flash patterns and has a last pattern recall function. Connection is via a cigarette lighter adapter with on/off and flash pattern switches. 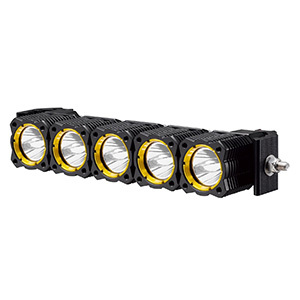 Prestige stocks three types of LED flood and spot lights in powers of 15W, 18W and 48W. These utilize powerful configurations of 3W epistor LEDs whose color temperature is 6000K. They are compact units meant for side mounting. The largest outputs 3500 lumens. Prestige LED light bars are easy to configure online. Each product page has a block schematic of the light bar’s footprint. Black bars on the perimeter of the diagram represent the light heads. Clicking on each light head allows you to specify one of six colors for the LEDs so you can customize your order. 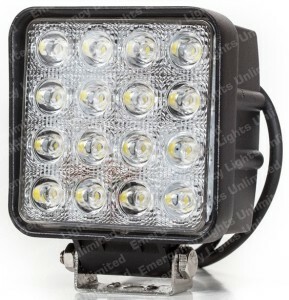 Every Prestige LED light bar review has been from public safety workers or emergency first responders with experience in emergency lighting options. They commonly compare Prestige light bars favorably to those made by Whelen or Code 3 but note that Prestige pricing is much better. Universally, they give these light bars 5 stars for brightness, the number of flash patterns and how well the magnetic mounts grip the roof at speeds up to 90 MPH. The cigarette lighter power adapter and switches are a hit with tow, rescue and snow plow operators who do not want to hardwire the light. They are also pleased with the LED color selection, which is a couple colors more than many vendors supply. Prestige has not been around as long as other vendors in the emergency vehicle lighting market, but they are quickly making a name for themselves with quality products at affordable prices. 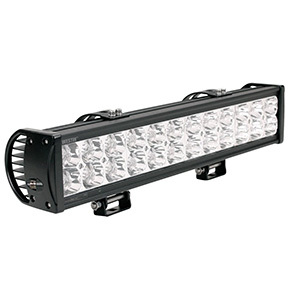 The smaller LED light bars are catching on with customers who do not require a permanently mounted warning light. The company has a slimmer catalog of light bars than larger competitors, but they appear to be keeping up by providing the core features buyers want and offering products with solid performance.